An efficient algorithm is proposed for Bayesian model calibration, which is commonly used to estimate the model parameters of non-linear, computationally expensive models using measurement data. The approach is based on Bayesian statistics: using a prior distribution and a likelihood, the posterior distribution is obtained through application of Bayes' law. Our novel algorithm to accurately determine this posterior requires significantly fewer discrete model evaluations than traditional Monte Carlo methods. The key idea is to replace the expensive model by an interpolating surrogate model and to construct the interpolating nodal set maximizing the accuracy of the posterior. To determine such a nodal set an extension to weighted Leja nodes is introduced, based on a new weighting function. We prove that the convergence of the posterior has the same rate as the convergence of the model. If the convergence of the posterior is measured in the Kullback-Leibler divergence, the rate doubles. The algorithm and its theoretical properties are verified in three different test cases: analytical cases that confirm the correctness of the theoretical findings, Burgers' equation to show its applicability in implicit problems, and finally the calibration of the closure parameters of a turbulence model to show the effectiveness for computationally expensive problems. van den Bos, L.M.M, Sanderse, B, Bierbooms, W.A.A.M, & Van Bussel, G.J.W. (2018). 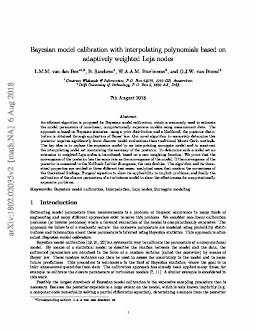 Bayesian model calibration with interpolating polynomials based on adaptively weighted Leja nodes.